Courtesy of BioGlow, San Francisco, California. 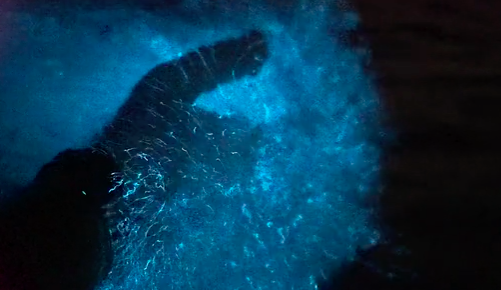 Catalina Channel swimmers enjoy the bioluminescence of the Pacific Ocean. Other ocean swimmers around the world - from Molokai Channelistas to their equivalents in Hong Kong - marvel at the brilliant blue emissions in the ocean. Keegan Cooke and Kevin Rand of BioGlo, The Bioluminescent Aquarium, are now bringing that blue brilliance to bedrooms, offices and homes around the world. For more information on BioGlo, visit here. There are also other alternatives including products by Bioluminescent Aquarium [shown below].